It’s no secret that Whiteleys Shopping Centre on Queensway in Bayswater has seen better days. Yet plans are set to be agreed this year by Westminster City Council which could bring this Bayswater street and its iconic building into line with its more upmarket neighbours of Notting Hill and Hyde Park. 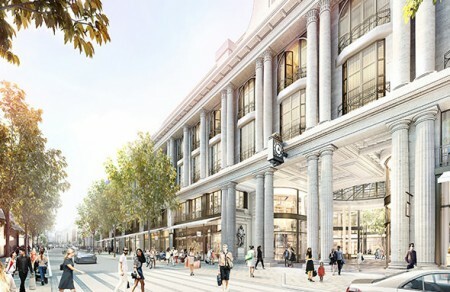 So what’s the plan for London’s first ever department store and its High Street? Whiteleys Shopping Centre along with many other buildings on Queensway was bought for a total of £500 million back in 2013 by a joint venture between an unnamed Brunei family and Dutch property fund Meyer Bergman with the aim of turning the scruffy street into the ‘Covent Garden of the West’ by 2020. 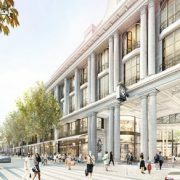 Architect Lord Foster’s firm Foster + Partners drew up and submitted plans last year on behalf of the developers, a joint venture between a Meyer Bergman-advised fund and Warrior Group. The ambitious £1 billion redevelopment plan could get approved this year by Westminster Council with the first round of feedback expected this month. At the heart of the Whiteleys redevelopment is a plan to restore the 1911 building to its former glory with the Grade II listed façade and central dome being retained but the rest of the 1980s building being rebuilt to make way for a mixed scheme of shops, restaurants, over 100 homes, gym, multiplex cinema and an upmarket hotel. According to the Evening Standard, a selection of ‘quirky idiosyncratic retailers’ would inhabit the first and ground floors with a central courtyard opening onto a reinvigorated Queensway. 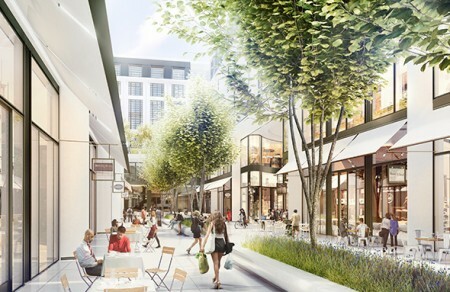 Alongside the redevelopment of Whiteleys Shopping Centre, Westminster council also has big plans to improve Queensway which is seen by many as grubby and down at heel. The road is set to be transformed into a pedestrianised boulevard with new paving, lights and trees. Naturally fears have been raised by some local residents over the scheme. Some worry that the Whiteleys heritage will be hidden from the public and others that the development will end up being too ‘exclusive’. However the developers insist the historic domes, façade and staircase will be kept. How much will be on public view remains to be seen. Whiteleys has the honour of being London’s first department store and has a chequered history. Opened by William Whiteley in 1863 as a drapery store it expanded into a row of shops on Queensway with numerous departments, employing more than 6,000 people at one point. After his murder in 1907 Whiteley’s sons continued growing the business with the main building being designed and built in 1912 with distinctive colonnaded façade being added in 1925. Although the building has been victim to several fires over the years, many of the original features remain and are Grade II Listed, including the La Scala staircase, tiered atrium and marble floors. We will watch with interest this year as decisions are made by Westminster City Council. One thing is for sure, Bayswater sorely needs its high street to be improved and we look forward to seeing progress to bring this area to its full potential.